The time has come and your kids are back to school, and you’re wondering “should I be better prepared for this?” The answer is yes. Below are five tips that will make your life much easier and better prepare you for your kids being back in school. Clean your coat closet and entryway to create space for your kids to store all of their belongings, including jackets, sports and music equipment, backpacks and other school gear. We know that kids often come home and throw their stuff everywhere, creating a tornado like result. However, it’s important that all of their stuff gets put in a specific place, even if it’s you that is putting it there! Going back to school is a big change, for both kids and parents. However, you don’t want your kids to look at it as a free pass from doing their chores. 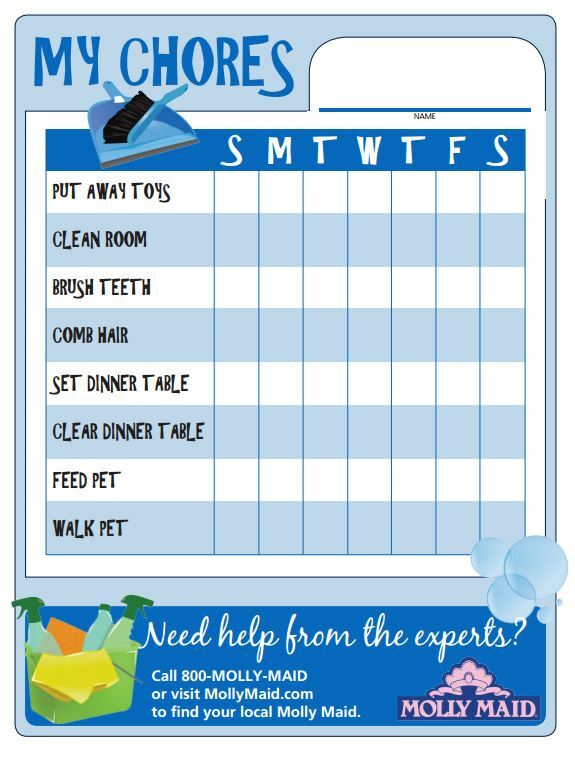 A great way to organize your children’s chore list, and make sure they are completed is by using the Molly Maid Chore Charts! A great way to save time in the morning is by getting organized the night before. Help your kids choose their outfits, for the next day and lay everything out, from jackets to socks. Also try packing up their lunches a day in advance. Getting in a disciplined routine of this will help hinder the all-too-familiar early morning scramble! Like to save time? Check out our What Is Your Time Worth? calculator to find out how much time Molly Maid’s cleaning services could help you save.